KJW has recently started building Gas Blowback Rifles (GBBRs), and the newest model is the KC02, a replica of the ubiquitous 10/22 rifle. It uses a gas-in-mag firing system, and is fitted in a tactical stock, which is fitted with M4 type furniture. This rifle could easily serve in a scout rifle role, and I will discuss all of the various aspects of it in this review! I obtained this rifle through Airsplat, who was the first US based retailer to have the gun in stock. It is currently for sale HERE, priced at $249.99, qualifying it for Airsplat's free shipping deal. After some SNAFUs on UPS part, I received the gun safe and sound, and could get to work tearing it apart to see how it ticked. As mentioned before, the KC02 is a gas blowback rifle, which houses the propellant in the compact magazine, along with BBs. It is based on the Tanio Koba 10/22 blowback design, which seems to be a pretty effective and efficient system. It has some very interesting features, such as the externally, and incredibly easily adjustable hop-up, long top rail, integrated rails in the tactical stock, and a 14mm- threaded muzzle, which is covered by a protective cap. Along with the gun itself, KJW has included a single 22 round magazine, loading tool, a small box of BBs, rail covers, and a manual to cover the basics of operating the gun. It's pretty much ready to roll out of the box, just add your choice of gas and BBs, and you're ready to rock and roll. KJW built the KC02 out of a variety of materials, but mainly polymer for the stock system and rails, and metal for the receiver, barrel, and trigger mechanism. The layout and balance of the gun is great, and the pistol grip on the tactical stock makes it very easy to handle. Colored in a matte black finish, you will have a minimum amount of reflected light coming from the gun. Shouldering the gun is accomplished using an M4 style 5 position LE stock, which is compatible with aftermarket AEG stocks. The stock tube is metal, and fits to the receiver very sturdily, with no wobble whatsoever, however, the stock itself does have some freeplay on the stock tube. At the bottom of the stock, you will find a metal sling mount. The receiver is comprised of two pieces, the metal upper piece which houses the firing mechanism, and the lower portion, which is part of the one piece tactical stock. The lower portion is made of plastic, and serves as a place to mount the stock and grip. The upper, which is metal, is largely hidden by the lower plastic portion, only really showing the cocking handle on the right side. The controls are housed in a metal trigger assembly, which is attached to the upper receiver using two pins. The whole assembly is hidden inside the plastic frame, with only the trigger, safety switch, and magazine release being easily visible on the bottom of the receiver. The trigger pull is light and crisp, and quite short, only 3-4mm. The safety is a crossbolt type pushbutton unit, with colored o-rings to indicate if it is in the safe or fire position. Note, the gun can only be put on safe after the gun is cocked. The charging handle is located on the right side of the receiver, and it reciprocates with every shot due to the GBB system. Upon running out of BBs, the bolt will lock back, allowing you to replace the magazine, then pull the handle back slightly to release the lock, and recock the gun. 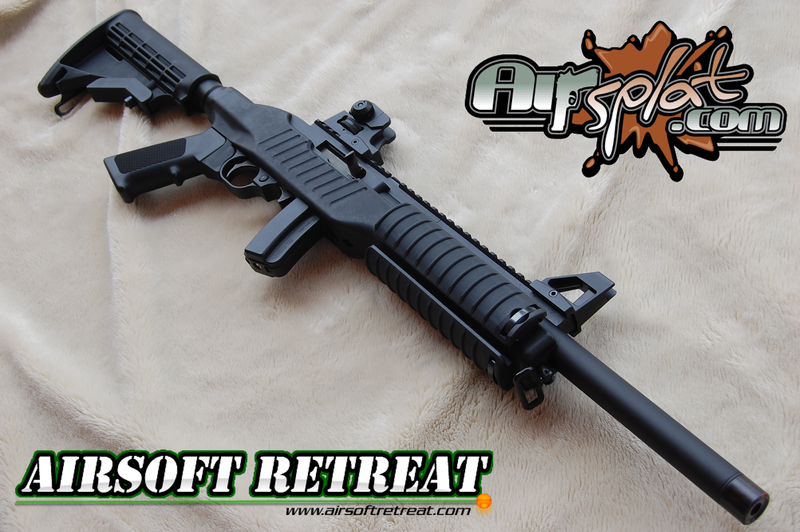 The pistol grip is a standard M4 style grip, with texturing on the sides for enhanced grip. It is a real steel type grip, so you can replace it with an aftermarket grip if you choose. Moving forward on the frame, you will find the handguard, which is adorned in rails at the 3, 6, and 9 o'clock positions. The rails are made of plastic, but they seem to be quite sturdy. KJW included rail covers to make holding the gun more comfortable. At the front of the handguard, you will find a metal sling mount, which when used with the mount on the stock, allows you to use a two point sling. The outer barrel is metal, and is a bull barrel design, keeping about a 1" diameter throughout. It is attached to the receiver in the same way as the real gun, using a metal wedge piece that holds it in place using two screws. On my gun, the screws were quite short, only grabbing onto the first 1-2mm of threading on the receiver, which promptly cause them to strip, causing extreme amounts of barrel wobble. I replaced them with some screws that were about 4mm longer, and now it locks on very securely. You can unscrew the muzzle cover to expose a 14mm- threaded muzzle. Aiming this gun is accomplished using the included M4 style removable iron sights, which are attached to the two piece upper rail. The front portion can be removed to give you a shorter overall upper rail length. The rail is made of high impact plastic, however, I don't really foresee any durability issues with it. One of the best features of this gun is the hop-up adjuster, which is located on the top rail. It can actually be adjusted with your finger while firing the gun. It locks into your chosen position quite well, and does not loosen itself while firing. KJW didn't include any trademarks on the KC02, aside from a small "Made in Taiwan" mark on the left side of the frame. The included magazine is full metal, and holds 22 rounds, with the gas capacity to fire about 35 rounds. Its low capacity lends it better to sniper/scout rifle duty, which it can certainly achieve with some practice, and tweaking of a few parts. There are are small nubs and dents on the left side of the magazine, which allows you to line up two magazines together, with one being upside down. They don't lock together, so you will need to tape them together for it to be secure. As far as magazine pouches go, these fit best in either pistol magazine, or even in 40mm grenade pouches. They are too small for most assault rifle magazine pouches. Gas consistency wasn't TOO bad, however, I did see the occasional spike above 440 FPS with 20 seconds between each shot. It didn't seem to exhibit too much cool down during rapid fire, but being a GBBR, pumping through all 22 rounds in a few seconds will drop your FPS. Accuracy and range were actually pretty good stock. Using .28g ammo, with the hop-up dialed in (a very easy task considering the placement on the top rail), I was easily able to hit my standard torso sized target out to 160'. I was exhibiting a slight amount of right hook in my shots, so I ensured that the barrel was properly aligned, and corrected the drift. After I did that, it shot great, right through my crosshair, which I zeroed at 140'. Gas consumption is actually great for a GBBR. Normally, I find myself struggling to even get a magazine's load of BBs out of a single gas charge, but with the KC02, I was easily able to get two magazine loads of BBs out of a single gas load, if I took my time between shots. It was really surprising, especially since it has a tiny gas reservoir. Internally, the KC02 is, cosmetically, quite similar to the real 10/22, however, it is obviously not the same. The upper receiver and outer barrel can be removed from the tactical stock in one piece, allowing you to mount it in a real steel stock, after modifying it a bit. It can be removed by unscrewing the lower screw, as well as the one at the rear of the upper receiver. You can then pull the whole firing mechanism out of the stock. At this point, you can unscrew the two screws on the barrel mounting wedge, which will loosen up the outer barrel. To remove it fully, you will need to unscrew the top rail, which also holds the barrel to the receiver. With the outer barrel removed, the hop-up, inner barrel, spacer, and barrel extension will all slide out. I don't know why they didn't go with a full length inner barrel, but it is likely to control FPS and keep it from going too high out of the box. The receiver can now be split into two parts, by removing the two lower pins, and freeing up the trigger unit. The trigger unit houses the hammer, safety switch, magazine release. I would recommend occasionally lubricating the hammer to ensure smooth firing. Inside the upper receiver, you will notice the bolt, which houses the blowback system. The bolt is made of metal, but the blowback system is largely made of high strength plastic. You can lubricate the top of the bolt to ensure that it slides smoothly inside the receiver. There are a few upgrades for this gun out currently, with most of them being made by RA Tech. You can get a full length tightbore barrel, however, it will raise your FPS substantially. For me, I just decided to install the gun into a real steel wood stock, which I refinished before installation. I wrote a tutorial on how I did this here: http://www.airsoftretreat.com/forums/index.php?topic=100578.0. I've been a big fan of 10/22s for years, as it was one of the first guns I ever shot, and I couldn't pass up the opportunity to own one that is skirmish ready for an affordable price. Before, if you wanted an airsoft 10/22, you pretty much needed to spend almost a grand on a TK, if you could find one. After I swapped mine over to a wood stock, it feels fantastic, and is absolutely perfect for a scout rifle. I will be tweaking the internals slightly to better fit that goal, and I will document my progress as I go!